Senior Nathan Bodger confesses he used to be “kind of frantic” about addressing climate change and other environmental issues. 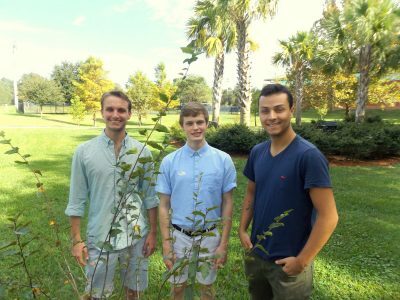 From left, Stetson Environmental Sustainability Fellows Matinicus Csenger, Nathan Bodger and Gabriel Rey stand beside one of the trees planted on campus on Arbor Day last April. These days Bodger, whose minors include environmental science, philosophy, history and international studies, is both more reserved and more focused in his efforts. Bodger, along with first-year environmental science major Gabriel Rey and junior Matinicus Csenger, a double major in economics and philosophy, are all Stetson Environmental Sustainability Fellows. Part of their duties as fellows includes conducting the university’s greenhouse gas audit, which Stetson began biannually in 2006 and annually since 2014, as part of its Environmental Sustainability initiatives. The audit tracks the university’s carbon footprint – that is, how its numerous activities may be affecting the climate and contributing to global warming – and aids the school in finding ways to be responsible stewards of the environment. Environmental responsibility, Csenger noted, is included in Stetson’s mission and values statement. Though the greenhouse effect is a natural occurrence around the earth, human activities have increased greenhouse gases and enhanced the greenhouse effect over the past 50 years, causing climate change, according to NASA at climate.nasa.gov. The environmental fellows gather data and reports “largely through email” from “each of the little silos within the school,” says Csenger, a Naples, Florida, native. The data includes, for example, reports from Facilities Management detailing the amount of fertilizer used on athletic fields and campus green spaces, and the amount of fuel used by the university’s fleet of golf carts and “P-Safe” (Public Safety) vehicles. New to the audit this year is a tree-mapping project initiated by Csenger, who plans to go into green energy development. A preliminary calculation determined that 35% of the campus is covered by trees. Csenger is re-running the calculation using more detailed, accurate campus boundary information from Facilities Management, and the project also will determine a monetary value of the CO2 that is sequestered. The fellows will input data from the greenhouse gas audit into SIMAP (Sustainability Indicator Management and Analysis Platform), a subscription software program created by the University of New Hampshire and located online at unhsimap.org. SIMAP “is a carbon and nitrogen-accounting platform that can track, analyze and improve your campus-wide sustainability,” the website says. The fellows, under the guidance of faculty advisor Tony Abbott, Ph.D., associate professor of Environmental Science and Studies, will produce a report on the audit by March. 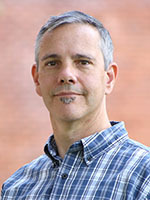 (Abbott currently is on sabbatical and Robert Sitler, Ph.D., professor of World Languages and Cultures, Director of the Latin American and Latino Studies Program, and an avid environmentalist, is acting faculty advisor). 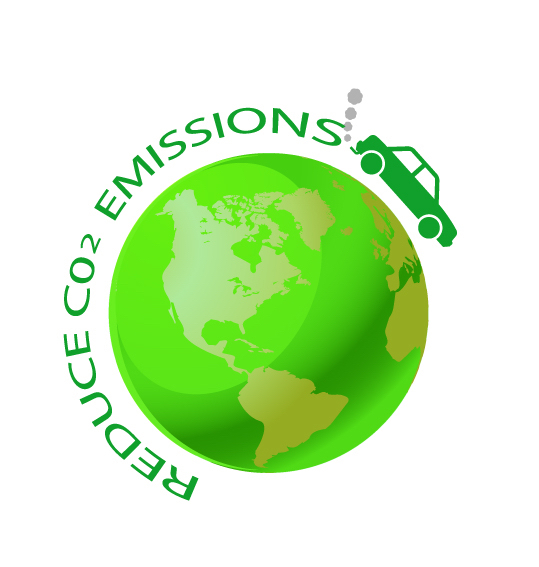 That report in turn will be shared with institutions that are part of the American College & University Presidents’ Climate Commitment (ACUPCC), a network of colleges and universities committed to neutralizing their greenhouse gas emissions. Stetson is one of Second Nature’s 596 active signatories and is part of the network’s “carbon commitment.” Stetson has set a goal to achieve “carbon neutrality” by 2050, according to the university’s Environmental Stewardship Plan, which spells out its many conservation efforts and other initiatives, such as building energy-efficient and environmentally responsible facilities. Csenger is confident that the efforts of Stetson’s environmental sustainability fellows, the university and the Second Nature network can affect change.